"Forts and Castles, Volta, Greater Accra, Central and Western Regions" is the collective designation of Western-style fortifications and outposts (mostly Portuguese, Dutch and British) along the Gold Coast during the colonial period. They were constructed as posts for the trade in gold and later slaves. The term specifically applies to 28-35 ensembles designated as a World Heritage Site by UNESCO in 1979. 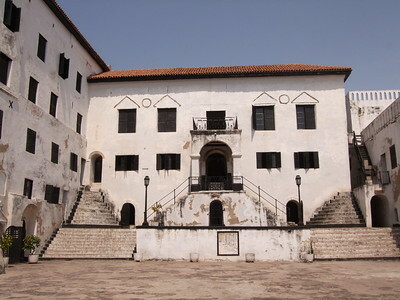 Two of the castles/forts that are designated as WHS are located in Elmina. In fact, those two phenomenal historical buildings still dominate this small fishing town. I started out with a tour at St. George's Castle (Elmina Castle) - the oldest European castle (and according to some sources even the oldest European remains) in Africa below the Sahara. There were about 8 foreigners in my tour group, more than I had met so far in the rest of Ghana: these castles obviously are the closest thing Ghana has to a tourist attraction. Right after entering the castle, I was amazed how pretty it is. I somehow had expected a gloomy atmosphere in a half-derelict castle. But this one is freshly whitewashed, very large and holds several buildings within the main compound. The governor slept well in his spacious residence. At the center of the main courtyard there is a Portuguese church. The ugliness starts underground, with the dungeons where the slaves were being kept until they were put on transport to the Americas. From St. George's one gets good views at Fort St. Jago, on a hill in Elmina. From that spot the Dutch raided the former Danish castle in 1637, and were able to keep it for 234 years. It's a steep walk to get up there, one that I did forsake because of the extremely hot sun. About 15 minutes drive eastwards along the coast lies Cape Coast Castle. This one has been British for most of its history. Like St. George's in Elmina, this is also an extensive and intact complex. Here even more slaves were held, there was room for 1000 men. Via an underground tunnel they were lead to a door (the "Door of No Return"), where at the other side a ship would be ready to take them overseas. The conditions under which they where held in the castle were really excruciating: 200 men a room, little fresh air, damp and dark. To summarize my visit, I would say that I was happily surprised about the size and condition of the castles. They seem to be visited by a number of foreign tourists and also by busloads of schoolchildren. I did find the tours conducted at both castles a bit uninspired though. P.S. : I even had to fill in a WHS questionnaire! A guy at Cape Coast Castle was interviewing visitors, and his questions focussed on the castle's WHS status (Have you visited more WHS in Ghana? Can you name them? Have you visited WHS elsewhere in the world? etc). The reason behind this research is to find out what more can be done to keep the castles in good shape. If yuo have just a day these 3 are a must see. Cape Coast is "best" as the guided tour has lots of information and there are some small expositions. Elmina can be done without guide I think then but ELmina is nice with local fish market. Do go there with guide so they can show you more and do make the walk up to St Jago too! Worth it. From Takoradi you can visit 5 forts on a day without problem. There are 3 to the west of which Axim and Dixcove are very nice restorted. Butri is located on Butri beach which is a beautiful beach to also relax! Put Google Maps to "The Hideout" on the beach. From there you can walk up to the castle. - Fort Saint Antony, Axim --> i already visited after Nzulenzu stilt vilalge and the 2nd day i did 4 forts and Butre beach. Komenda is not maintained; it's a ruin and i wouldn't go if it wasn't UNESCO. Komenda is beautiful restorted too. All these small forts take about 30 minutes to see/tour. The following 3 forts are best visited on the way back from Takoradi. In the morning I visited Kakum park and then the 3 forts. - Fort Amsterdam, Abandze --> ruin, but nice to visit and I think the only one where you can actually walk through the door of no return. - Fort Good Hope (Fort Goedehoop), Senya Beraku --> it has now a guesthouse; you can walk around and ask to go up the ramps. I went to the castles at Elmina and Cape Coast, both which to me are integral testimonies of Ghana's colonial history. The tour at Cape Coast castle enabled me to revive the impressive history of this castle and its influence on Ghana as a british enclave. Both castles are well kept and truly deserve a visit. Hopefully UNESCO along with the ghanian authorities are able to see further from the declaration and include the cities, particularly in the case of Elmina, which I think has potential to become a WHS. Serious work has to be done to preserve the cities and to establish efficient touristic infrastructure, which is lacking. It would be a shame if work is not done to the towns, because, just as the castles, I truly believe they bear testimony to european first interactions with Africa. In Nov 2010 we visited Cape Coast and Elmina castles (just 15 kms apart) and climbed up to, but didn’t enter, Fort St Jago which is also at Elmina. These are the most popular cultural tourist sites in the country and a tourist visit to Ghana without seeing at least one of them is unthinkable. Both castles are impressive buildings and are wonderfully situated right on a coastline of fine beaches next to fishing harbours and markets which extend right up to the castle walls. Their colourful activity is an interesting part of a visit. The blue of the sea, the gold of the sands, the greens of the palm trees, the white of the castles and the multi-coloured boats will lead you to use up a fair chunk of your digital photo card! The buildings are of course indelibly associated with the Atlantic slave trade and, for many people that will be the main focus of a visit. The dungeons are certainly impressive in their size and, if you are so inspired, a stimulant for introspection on the events which happened there. And if you only have time for one? A difficult call! I think I might actually go for Elmina. Although smaller and with “less impressive” dungeons it is in some ways the more significant historically. Also, as well as having 2 forts, the town is perhaps more interesting. But better to avoid the problem by taking in both – this is easy enough in a day! just outside of cannon shot range from a fort of another country. Gold production: Originally built to profit from the gold trade. Elmina means "the mine". Christopher Columbus: "In late 1481 or early 1482 Columbus sailed to the Portuguese fortress of Elmina, in what is now Ghana, on the western coast of Africa. Columbus was impressed with the riches Africa offered, especially gold. In addition, like all good navigators, he was eager to learn about winds and ocean currents from the local pilots and sailors. In the waters off the coast of Africa and the nearby Canary Islands Columbus first observed the ocean phenomenon known as the Canaries Current. Knowledge of this fast-moving current running west of the Canary Islands could well have been the reason that Columbus later chose to start his crossing of the Atlantic in the latitude of the Canaries, far south of Spain or Portugal. 45 Community Members have visited.